We just have a quick announcement for you all if you live in the Toronto area. 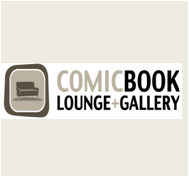 This past weekend I dropped off a stack of books at The Comic Book Lounge + Gallery in Toronto. It's a really great comic book environment west of Spadina on College Street in Toronto. All of our books are available at the store for $5, and while supplies last, you'll also get a copy of Crystal Fractal Universe #0 with the purchase of any one of our comics. So basically you're getting two books for $5. Yeah. Our books are also still available at Silver Snail, Paradise Comics, Altered States (in Mississauga) and The Comics Room (Scarborough). So be sure to ask about them next time you're there! On a side note, we've also finally got our online store back up and running. You'll need a paypal account, but you can now purchase any copy of our books, and get an accompanying copy of CFU #0 with it for free. Yes, free. Still cool, right? Five dollars, two books. :) Supplies are limited though, so get your copy of the "Zero Issue" while you're still able to!